Goa is India's smallest and most liberated state. It was actually a colony of Portugal up until 1961, and a strong Portuguese influence still remains. Goa's coastline stretches for around 100 kilometers (62 miles) and its beaches have become extremely popular tourist destinations. However, Goa has much more to offer than just the beach! It’s particularly picturesque during monsoon time from June to September. Nature flourishes, the rain brings refreshment and romance, and Goa takes on a more traditional flavor. 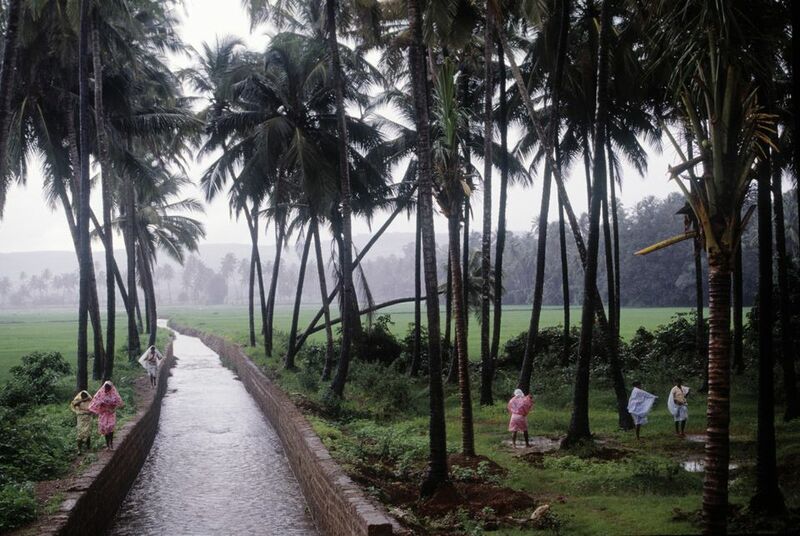 Travel to Goa during the monsoon and you'll be able to experience it the local Goan way. Most of the party crowd has gone. Instead, Goa is popular with Indian families on vacation at this time of year. What's the Monsoon Like in Goa? Those who are unfamiliar with the monsoon in India will probably be wondering just how much it rains. The reality is that the monsoon is very unpredictable! It can rain heavily for days and then be dry for days. It does rain frequently though. The power often goes out too. The rain eases up a bit in August and September, with shorter downpours and more sunny patches. Something to be aware of is that Goa's beach shacks are packed up during the monsoon season. As a result, lesser-developed south Goa is virtually deserted. It's better to head to north Goa, which has more permanent structures. You'll find the most action happening on the most developed stretch from Candolim to Baga beaches. Baga, especially, is favored by domestic tourists during the monsoon. Unfortunately, some groups of Indian guys do get drunk and rowdy, and women may feel uncomfortable. Instead, going inland to experience Goa's hinterland and villages is recommended, in places such as Aldona, Saligao or Siolim. Goa's wildlife sanctuaries are open all year round. The major ones are Mollem National Park and Cotigao Wildlife Sanctuary. They are harder to reach than Bondla, the smallest and most accessible sanctuary in Goa, though. As well as nature trails, Bondla has a mini zoo and deer safari park, which is great for kids. The imposing Dudhsagar Falls, located on the fringe of the Mollem National Park, is at its best during the monsoon as the water rages down from a huge height. Expect huge crowds though, as Indian tourists consider it a must-visit! If you prefer to get off the beaten track and avoid the tourists, Tambdi Sula waterfall in nearby Bhagwan Mahavir National Park is a much better option. While there, you can also visit the ancient 12th century Mahadev Temple, believed to be the oldest temple in Goa. The acclaimed spice plantations around Ponda are another popular place to visit during the monsoon in Goa. An evening boat cruise up the Mandovi River from Panjim is enjoyable, and Goa’s historic character-filled buildings provide much interest. You can wander around the Fontainhas Latin Quarter and soak up the atmosphere or visit old restored Portuguese mansions. The monsoon season is also the perfect time for white water rafting in Goa! One of the best reasons to visit Goa during the monsoon is the vibrant festivals that take place. The most popular festival, Sao-Joao (the fertility feast of Saint John the Baptist), is celebrated in late June and involves the interesting feat of men jumping into overflowing village wells to retrieve bottles of local feni alcohol. The feast of Saints Peter and Paul, at the end of June, sees people sailing upriver on rafts performing plays and songs. In late August, the carnival-like Bonderam flag festival is held on tiny Divar Island, off the coast from Panjim. Ganesh Chaturthi is also observed in Goa. The Wildernest Nature Resort offers enticing monsoon season specials, and it’s an incredible place to stay right among nature. Cottages start from 5,500 rupees per night for a double, including all meals, tax, and activities such as nature walks, eco-tours, and trekking. This is almost 50% less than peak season rates. You'll also find very enticing monsoon rates at most luxury hotels in Goa. Compare the rates on these Top 5 Star Hotels in Goa and 15 Best Boutique Hotels in Goa. You may also be tempted by these villa hotels in Goa, homestays in Goa, and inexpensive places to stay in Goa. Inland, along the backwaters of Goa's hinterland in Aldona, Olaulim Backyards is lush during the monsoon season. Dudhsagar Plantation Farmstay is not far from Dudhsagar and Tambdi Sula waterfalls. However, the best monsoon activity there is a fish foot spa in the local river. Yes, the fish will come up and nibble your feet! Restaurants that aren’t located on the beach usually stay open during the monsoon. Lloyd’s in Calangute (after the chapel, on the Candolim Main Road) is the place to be on a stormy monsoon evening. It serves delicious Goan home cooking and is open through the night. The atmosphere is friendly and entertaining, with many people passing by and dropping in. You can also try Britto's on Baga Beach for seafood. Other popular restaurants that remain open include funky Artjuna garden cafe and lifestyle shop in Anjuna, Cantare in Saligao (it's a tavern with live music), Gunpowder (south Indian cuisine) in Assagao, and Mustard (Bengali-French fusion cuisine) and Morgan's Place (Italian) in Sangolda. Goa's famous nightlife is minimal during the monsoon, although the infamous Mambo's and Tito's at Baga Beach both rock all year round. Cape Town Cafe, on the same road, is also open. The bar at The Park Hotel in Calangute has regular DJs. In Candolim, there is hip Cohiba Bar and Kitchen with live music and Sinq Beach Club and LPK Waterfront with DJs. Bands can also be heard on Fridays at the more laid back Cavala, near Baga Beach. This place caters to an older crowd. Curlies on Anjuna beach stays open during the monsoon season as well, although Anjuna generally wears a deserted look. Check out the listings on What's Up Goa to see what's on in Goa and when. You may also want to try your luck at one of Goa's Top Casinos. Goa is well connected to the rest of India by all types of transport. However, the bus can be slow and uncomfortable, so try to fly or take the train where possible. Prepaid taxis are available at the airport in Goa. Trains on the Konkan Railway can cover the distance from Mumbai to Goa in less than 10 hours, with the best train being the Konkankanya Express. Most trains will stop at Margao (Madgaon), which is Goa's main train station. Some, such as the Konkankanya Express, will stop at other stations as well. Should You Visit Goa in the Monsoon? The reality is that Goa is pretty deserted during the monsoon and a lot of places are closed, so be prepared for that. If you go expecting a beach holiday or parties, you're likely to be disappointed. Instead, make the most of fantastic hotel discounts, delicious food, village life, and interesting Portuguese heritage.